22 cm xi, 338 p. : ill. Originally published: New York: Bantam, 2003. 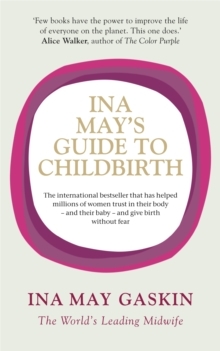 Ina May Gaskin, America's leading midwife, shares her exceptional birthing wisdom in this intuitive guide to childbirth. By sharing a wealth of knowledge generated by three decades of experience she explains why the natural birthing process, when left to its own devices, can proceed so beautifully on its own. In this invaluable book Ina May teaches you:- What really happens during labour- How to create a safe, comfortable environment for birth in any setting- Tips for maximising your chances of an unmedicated labour and birth- The risks of anaesthesia and caesareans - what your doctor doesn't necessarily tell youIna May's Guide to Childbirth is an inspiring read and gives women the opportunity to take back the fear of childbirth by regaining confidence in their bodies. It tells you everything you need to know to have the best birth experience for you - whether in a hospital, birthing centre or the comfort of home.